There are many ways to teach yourself how to draw with one of those being the use of common shapes for assistance. Please don't feel deflated if this particular method doesn't work for you. It's not for everyone but it's good to know all the different ways we can successfully get our images onto paper. Using shapes and outlines is part of the basics of learning to draw. When you observe whatever it is that you want to draw, mentally convert the general mass of that object into a shape that you recognize. So, if you were to draw a shoe, the main overall shape is perceived as a triangle. When you start to put what you see on paper, your pencil will flow along with those preconceived shapes. Sketch in light guidelines, just like a type of scaffolding, to help your eyes get the correct outline in its place. Once you have your guidelines (squares, circles, rectangles etc) in place, you can proceed to draw in the actual boundary of your subject, correcting it as you observe the variances between the shape and the object. This 'teach yourself how to draw' process gives you a sense of structure in drawing. When we look at anything, we see a complexity of form. So, to get the general look and feel of a subject, define the main outside shape with sure lines and if you want further assistance, you can add more blocks within it. 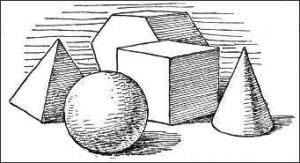 If you are not confident drawing an object freehand, then using shapes might just be the answer you are looking for. There's no harm in trying it out, is there? When you teach yourself how to draw, part of the process is to learn the common terms used by artists. The habit of recognizing and drawing shapes to assist an artist is sometimes called blocking-in. Drawing shapes to identify objects is a really popular method among trainee artists. Experienced artists also rely on shapes all throughout their careers, it's a very handy trick to get a drawing onto paper easily. You can block-in by drawing shapes encompassing your subject (the outside) or you can draw shapes within the boundary of its form. Oval shapes are commonly used to draw the human form and animals but if you tend to round off your forms too much, try using square shapes. 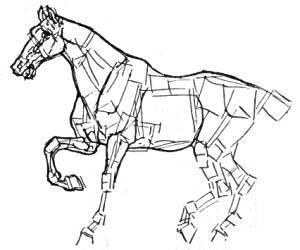 This example shows how the artist composed the form of a horse (sourced from a reference book). I feel there are too many blocks within the horse and that confuses me so I prefer to use big blocks that are shaped roughly to match what I see. A great benefit of being self-taught is that there are no restrictions, you make up your own set of rules as you go along and you're not forced to comply with another artist's way of thinking and doing. I placed a lot of emphasis on mastering outline drawing first and I used everything at my disposal for study purposes. I found there is another way to help identify form by imagining the subject to be all black. If you are copying from a picture, make a spare copy and color the object black. Place the black silhouette against a white background to see the true boundary without surface markings or shadows. Once all distractions are removed, the process is a lot easier for beginners. Concentrate on the edge, follow it as carefully as possible within a rectangular border. This encourages a larger style of drawing, since good outline means good perception of mass. It's a way of training your eyes to judge form correctly. This practice helps you ignore details. Details can be a real distraction for some of us and even though we are tempted to include them into our drawings early, we must learn how to ignore them. If something is amiss in your sketch, compare your outline to the blackened image to find where it is out. If you are keen enough to teach yourself how to draw, outlines are a good beginning, one step at a time, just like learning to print then write. Once you feel you have mastered the first step of outline, then you progress on to the next step, learning each new method gradually. The use of line alone is a language, it can be most sensitive and it can be used for any purpose. It can appeal to our emotions and evoke passion. It has power and a wonderful range of expression. We all use line in a different way so we need to look for constant variation and individual difference. When you teach yourself how to draw, be gentle with yourself. Don't be a harsh self-critic of your work, view it as another step in the right direction. Learning to draw is not something to become impatient with, it is something to relish, something that helps you to grow as an artistic individual. Every artist wants to draw exactly what they see and this skill is simply a matter of time, experience and practice. Let yourself go with the flow of progression, we all have to start somewhere. See more information about drawing outlines with some step by step examples to include in your studies. In the end, you choose how you want to draw, just follow the path of your inner voice.